O 'Neil "Popeye" Powell's innings was the most explosive I had ever seen on American TV. Actually, it was the only cricket I had ever seen on American TV, but that is not the point. The game was the Connecticut Cricket League Championship final in September 2013 and was being covered by a local public channel that is so obscure that most people are unaware of its existence. Popeye opened the batting for the Sportsmen's Athletic CC (surely an ironic name given the physical condition of several of their players) and, after a slow start, launched a Chris Gayle-like assault on the Bloomfield Caribbean bowlers (it was no surprise when the "play-by-play" guys revealed that Gayle and Popeye had formed a fearsome opening partnership for Excelsior Primary School in Jamaica back in the early '90s). He ended up unbeaten on 193, which included 13 sixes. And I had a new hero. It didn't matter that the standard was what you would see at your local park on a Saturday afternoon, as was the crowd - with players comfortably outnumbering spectators. It didn't matter that the camera angles were bizarre. One was permanently stationed behind third slip with the other zooming in and out of the action from somewhere in the vicinity of fine leg. It was like cricket directed by Fellini. And it didn't matter that the commentator, more at home with high-school lacrosse games, was floundering badly with an unfamiliar sport. He eventually gave up and left the startled studio analysts to take up the commentary. All that mattered was that "Popeye" Powell had reminded me how much I loved cricket. So when my wife Liz and I finally got ourselves a car, one of the first priorities was to take a road trip across the East Coast, visiting cricketing landmarks, finding out the state of the game and meeting like-minded people - in particular, those admirable souls keeping cricket alive in America. It was a warm, slightly overcast spring morning in April when we set off. The clouds were low and there was a slight breeze - the kind of conditions you would almost certainly bowl first in. By mutual agreement, Liz - a cricket fan since the 2005 Ashes series - drove. I still hadn't adapted to driving on the right and had had one too many near misses. I was relegated to the navigating role. As we left Hartford behind, my thoughts turned to what was in store over the next few days. I had planned the trip in great detail. First stop would be Bloomingdale Park, where, according to Wikipedia, the first-ever game of international cricket was played (in fact, the first international sporting fixture period, as the Americans would say). 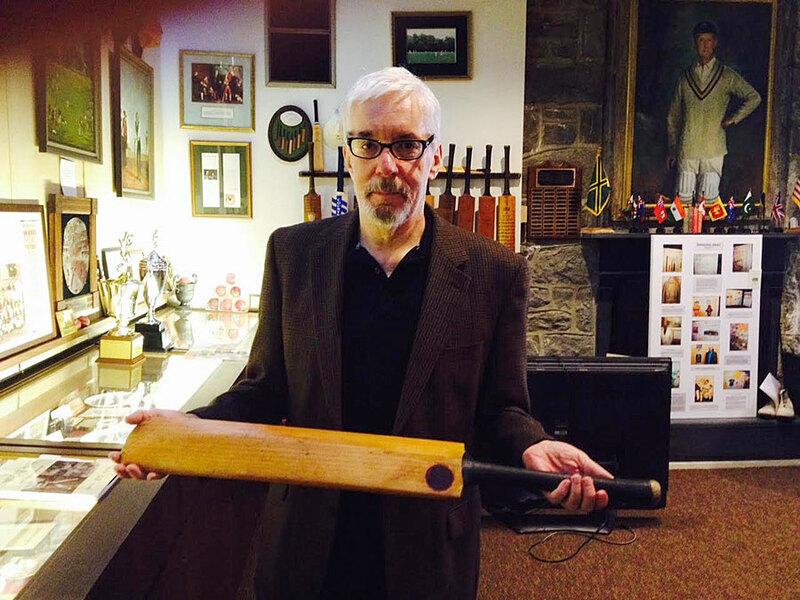 Then it was off to Haverford, Pennsylvania, where I would be shown around the CC Morris Cricket Library. 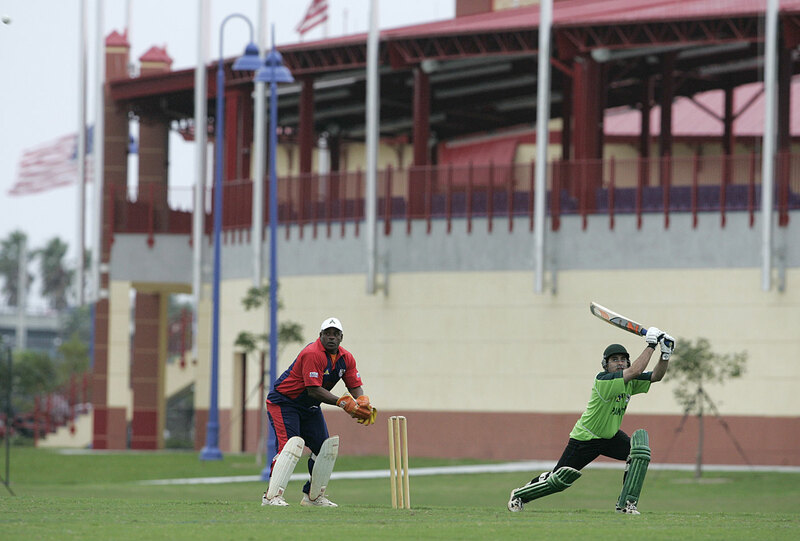 After that I would meet someone from the Philadelphia International Cricket Festival. Then it would be back to Hartford for the jewel in America's cricket crown, the Cricket Hall of Fame. As I silently congratulated myself on my organisational ability, we hit the New York City commuter traffic. My itinerary had failed to take into account the fact that we would arrive in one of the planet's busiest cities during morning rush hour. For the next 55 minutes we inched our way slowly through the Bronx, trapped behind a truck with a huge picture of Kim Kardashian on its back. The truck was transporting her brand of perfume, "A Voluptuous New Fragrance", which was ironic considering the stench of the fumes belching from the exhaust. While sitting in the slow-crawling traffic, and to avoid any awkward questions about my planning, I familiarised myself with Bloomingdale Park by looking at a few recent pictures on Google Images. It was an incredible feeling thinking that I would soon be standing on the same patch of grass where USA and Canada played out that very first match 170 years ago. Judging by the photos, not much seemed to have changed. The wrought-iron lamp posts and exquisitely carved wooden benches belonged to an era of bushy moustaches and horse-drawn carriages. I then took a look at a match report, which featured the scorecard. This indicated a few teething problems. Extras were top scorer and, in four innings, no one managed to post more than 14. But the fact that more than 5000 people were present sent a shiver down my spine as I imagined the scene. This was the very park where history was made. 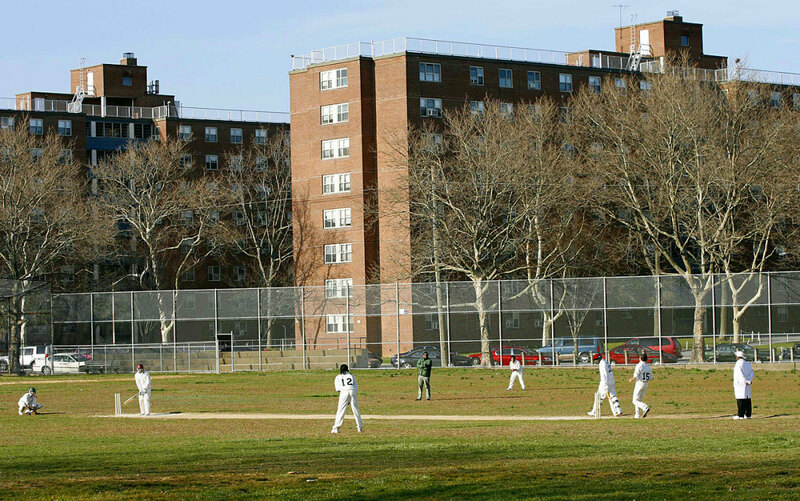 As I read on, I discovered with a mounting sense of alarm that the game had been played at an altogether different Bloomingdale Park, this one in Manhattan. Before I even had a chance to reset the satnav, I learnt that it no longer existed. It had been built over. 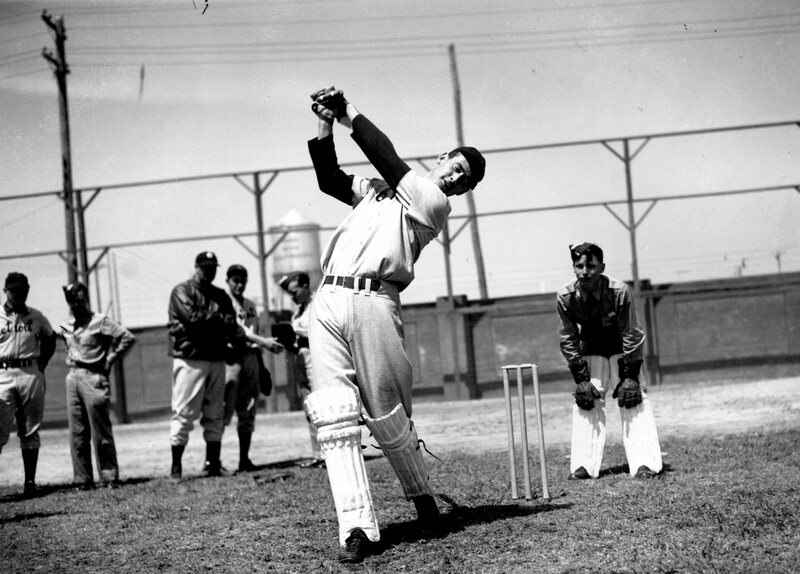 The home of the world's first cricket international was now home to the New York University Medical Center. My feeling of crushing disappointment gave way to slight relief when we finally parted company with Kim Kardashian at the George Washington Bridge, where cars and trucks use different levels. A certain chill had fallen over the car interior since the Bloomingdale Park misunderstanding and once we got into New Jersey a decision was made to take an early lunch. The meal seemed to help the atmosphere and we were soon on the road again with a renewed sense of optimism. By the time we reached the outskirts of Philadelphia, I put forward the idea of stopping for a tea break, but this was considered taking the cricket theme too far. Besides, we were only 20 minutes away from Haverford College*, home of the CC Morris Cricket Library and United States Cricket Museum. I had already spoken on the phone to its librarian, Joe, since his day job was teaching and he wouldn't be able to get the time off to show me around. This was to become a recurring theme during my quest. The people involved in cricket in the US all had full-time jobs and their time was given purely for the love of the game. Joe's cricket obsession was triggered by Nick Hornby's Fever Pitch. This turned him into a long-distance Arsenal fan, which meant he began listening out for their results on short-wave radio. And when the football and cricket seasons overlapped, he began hearing exotic-sounding snippets from the County Championship - what did Leicestershire 211 for 4 declared mean? And Hampshire following on? Following on from what? This thirst for knowledge eventually led him to Haverford College*, one of the few places he found where he would be able to catch a game. And during one of those games he got talking to the president of the CC Morris Cricket Library, who offered him the job of librarian. The university campus seemed pleasant but unremarkable, with the familiar sight of earnest-looking students scurrying around carrying Macbooks. The only thing most visitors probably hadn't seen before was the beautiful old cricket pavilion, which was straight out of a Wodehouse novel; a small piece of England in the corner of a foreign field. 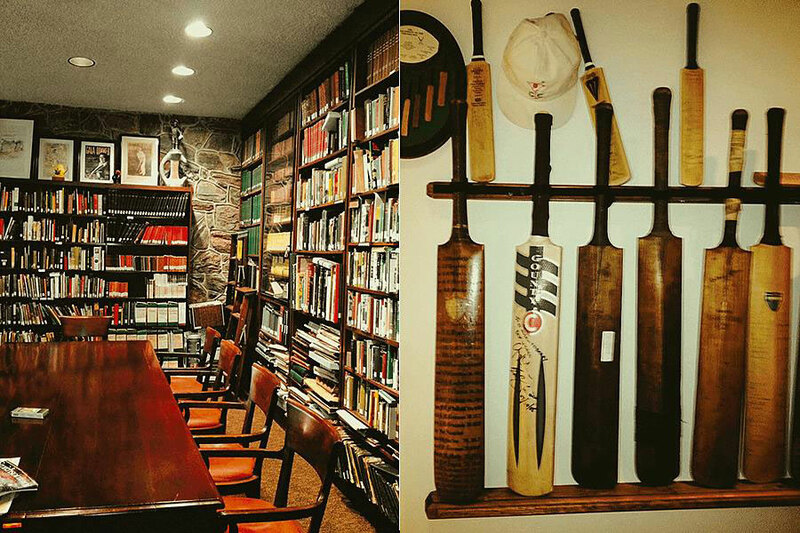 The cricket library itself was hidden away in the main library, a tiny room that few people were aware of. I know this because we must have asked a dozen people for directions and none knew what we were talking about. Including a young man sitting right outside it. As I walked through the oak doors, past a golden statue of WG Grace, and looked around, I felt an overwhelming sense of excitement. This was cricket heaven. After a warm greeting from Kathleen, the volunteer assistant librarian, I wandered over to the collection of cricket books, which filled dozens of bulging shelves. Immediately apparent was the reliance on dubious puns in the titles - No Boundaries, Driving Ambition, Calling the Shots, The Breaks Are Off and so on, as well as autobiographies of players I had never heard of. This tiny library in a little-known American town seemed to contain every cricket book ever written. Well, all but one. But more of that later. Lying on the table was a file with my name on it. Joe had insisted that this was the one thing I simply had to see. It was a series of letters between Dr Howard Comfort, a former president of the library, and Sir Donald Bradman. While Liz looked at the impressive collection of ties (300, by her estimation) I began to read the neatly typed letters. The exchanges were strictly formal at first. Bradman was, by all accounts, a private man, with a reputation for playing interviewers with a straight bat. When asked by Comfort if he would donate an exhibit, he pointed out that "my active cricket career having ended in 1948, practically all my souvenirs etc have been given away or bequeathed locally and therefore I am unable to let you have anything substantial for your museum". But after a few more letters, a package arrived from Adelaide containing a rare medallion, made from Bradman's favourite photo of himself. A beautiful green-and-black tie was next (Liz told me later that she knew the one he was talking about). "I treasure the connection," wrote Bradman, "and trust we may go forward doing what we can in the interests of the game." Bradman then announced that a long-standing journalist friend was visiting America "for the purpose of seeing and writing about golf". He was bringing with him a ball used in one of his many centuries for the national team, which he would deliver in person. After his friend's visit, something changed. It was hard to escape the feeling that the friend had been checking out the library and, in particular, Comfort, because the exchange of letters became more frequent. And Bradman began to open up. "Recent days have not been kind to the Bradman family," he wrote in 1977, describing his beloved wife Jessie as "an invalid with little or no prospect of adequate recovery" after suffering a heart attack. Later letters became longer, and Bradman revealed a deep distaste for the recently announced World Series Cricket. "I battle on in some discomfort, made all the worse by the inroads into our game made by one [Kerry] Packer," he wrote in 1977. "He has bought and contracted 50 of the world's best players to play test[s] and televise them in opposition to ours. The whole future of 1st class cricket is at stake." It was something he later came to terms with - in his 1985 biography Our Don Bradman (which I found on the CC Morris Library shelves), he said that he "accepted cricket had to become professional". In one of his letters, he mentioned a bat he was donating and I asked Kathleen if I could see it. She carefully removed it from a glass cabinet and placed it in my outstretched hands. It felt surprisingly light by today's standards and as I gazed at it, Bradman's wonderful description ran through my mind: "It is a pretty weather-beaten old warrior because it had a lot of use," wrote the great man, then 68 years old. "But probably that is the charms of an old bat - you can see the scars of battle." "Do you have a book called An Opener's Tale, by any chance?" "Bruce Edgar - New Zealand opening batsman from the 1980s - and David Roberts." As Liz edged towards the exit in embarrassment, Kathleen went over to her computer and began typing. "David Roberts?" she said, looking up briefly. "Would that be you?" I smiled modestly and nodded. "No, I'm sorry" she said, looking genuinely crestfallen. "Is it known under any other name? "Nope, just as An Opener's Tale," I said, without feeling the need to explain that the weak title was down to the fact we couldn't come up with a suitable pun. It was only a slightly deflating end to a thoroughly enjoyable couple of hours. It was time to go. Kathleen had already let us stay half an hour after closing time. At her request, Liz and I signed the visitors' book on the way out. It was a surprisingly sad experience. Flicking through the pages, it seemed visitors were few and far between - at times, they went three months without an entry. When we got back to the hotel, I noticed that I had missed a phone call. There was a message from the man I was meeting over breakfast to talk about the Philadelphia International Cricket Festival. He had some bad news. Something had come up at work and he wouldn't be able to make it. This was a disaster. Not only did this mean we would make the Pennsylvania leg of the journey without actually meeting any cricket people, I had also lost the opportunity to find out more about some of the laws that seemed unique to this particular festival. The one that fascinated me the most: "Any batsman hitting a ball into the construction area will be penalized ten runs." It was just as well "Popeye" Powell wouldn't be playing. I could imagine him leaving the crease with a score of around minus 150. The cancelled meeting was more than a lost opportunity to find out about an obscure rule. It also represented a fatal blow to my mission of meeting as many cricket fanatics as possible. So far, I hadn't actually met any. I sat down to collect my thoughts. To help me focus, I began to read the most recent copy of American Cricketer. It was the only magazine devoted to the game in the US and I had brought it with me, hoping to get a few more insights. 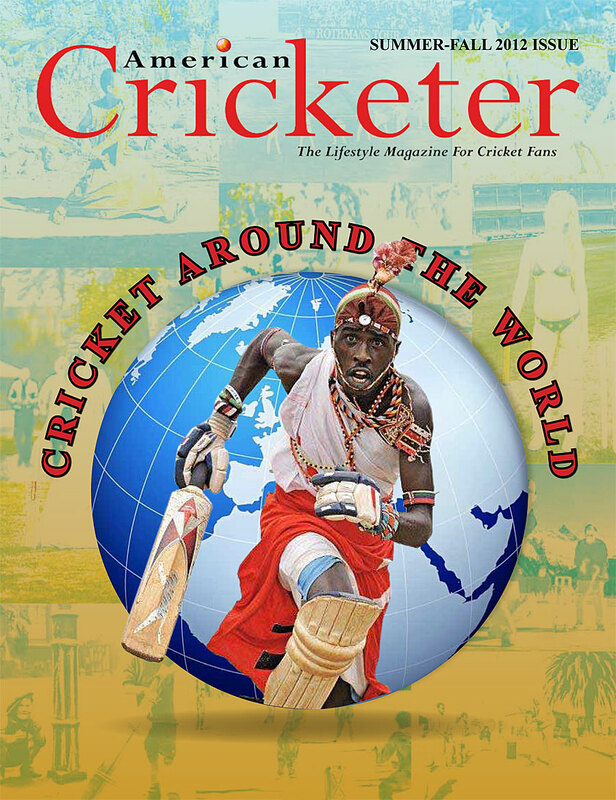 American Cricketer, published by Florida native Mo Ally, is available across the country at a unique selection of outlets, from Global Home Loan & Finance in New York City to Coley's Restaurant in Hollywood. The editorial featured Mo Ally's outspoken opinions on a variety of subjects, from the hopelessness of USACA, the sport's governing body in the US, to the hopelessness of the West Indies Cricket Board. A few pages later there was a glowing tribute to the latest inductee into the Cricket Hall of Fame in Hartford. This honour went to a man who had "developed the finest cricket ground in North Carolina", "conceptualised and developed the first Legends Weekend of Cricket" for which he was responsible for "logistics, promotions, opening reception, a gala finale dinner, cricket matches, media campaign, merchandise, concessions, travel arrangements and volunteer management". The name of the inductee? Mo Ally. A few pages after this was a section containing pen portraits of the players representing the "Caribbean Masters Club" on their tour of Australia and New Zealand. The club, I learnt, was founded by a "dynamic marketing and management executive with 40 years of outstanding accomplishment in sales and business development". If there was one man I needed to talk to about cricket in the USA, it was Mo Ally. Unfortunately, going to see him in Florida involved a 16-hour detour, which might have proved a tough sell to Liz. Instead, due to the total failure of the original idea, I decided to change my criteria. I no longer needed to meet people involved in American cricket. Starting with Mo, I would phone them instead. I sent him an email to see if I could ask him a few questions. "You may," came the immediate and economically worded response. I looped up a slow full toss to start our phone conversation. "So what's the future for cricket in this country?" "In my opinion there is no future for cricket in the US. It is in the doldrums." "But what about the Broward Stadium," I asked, citing the cricket ground the size of Headingley built in Florida about a decade ago. "It is a white elephant and will soon become a soccer stadium," was the response. Which would probably be a step up, since at the time of writing, it is home to the FC Fighting Squids, a local Australian Rules Football team. But if Mo was tough on the proposed home of the national cricket team, his biggest criticisms were reserved for USACA. To sum up his thoughts in a few non-libellous words, he didn't think they were doing a terribly good job. As we finished and I thanked Mo for his time, the satnav showed that we were not far from Queens, New York City. 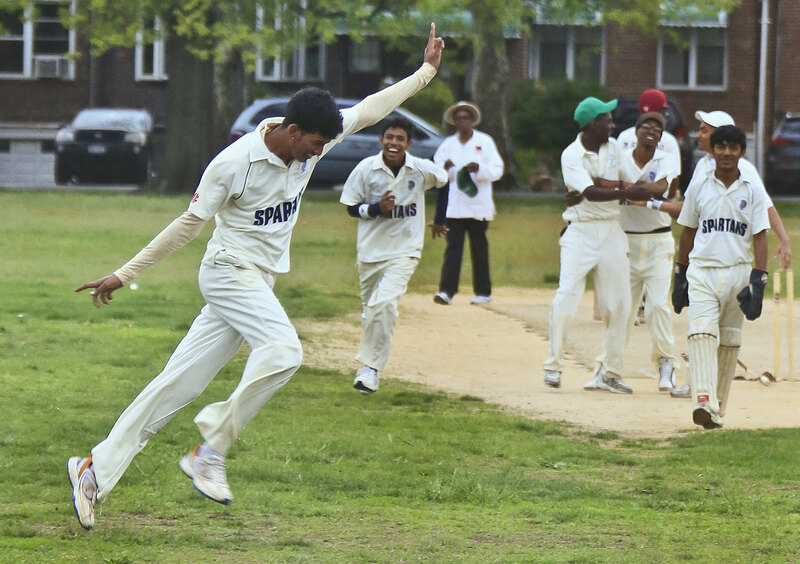 This triggered a burst of excitement because the borough was home to the Maspeth High School T20 team, possibly the most intriguing team in American cricket. They play in the New York Public Schools Athletic League and it would be fair to say that they have yet to make their mark. According to ESPNcricinfo they played ten games last season and scored a total of 303 runs, with 208 of these coming in extras. Extras were top scorer every time they batted. Their 2014 highlight was an impressive 57 against Newtown, a total that included 39 extras. Fifty-six of the 100 wickets were ducks. Six were out hit-wicket. Apparently this lack of success didn't stop them playing with smiles on their faces. and the current season, which had just got underway, had already brought signs of improvement. This included three figures for the first time, with a highest individual score of 45. I felt extreme disappointment when I discovered no game was scheduled for that evening. As we left New York behind us, my thoughts turned to our next - and final - destination. There is a Hall of Fame for everything in America. In my home state of Connecticut, we have the Estate Agent Hall of Fame, the Connecticut Trapshooters Hall of Fame and the Personal Injury Hall of Fame. But probably even lower in the public consciousness than these is the Cricket Hall of Fame. I had heard a lot about it and there was much to look forward to, including, bizarrely, VHS tapes of old matches and eight-bit computer cricket games from pre-PlayStatsion and Xbox days. As we passed the "Welcome to Hartford" sign after four hours on the road, time that I had mainly spent online and on the phone, Liz informed me that she had had enough for one day. She was going to drop me off at the Hall of Fame and I could make my own way home. I knocked on the door but there was no response. I tried ringing. The phone rang inside. No one picked it up. This was a sinking feeling. If only I had paid more attention to the review on Yelp.com, which warned: "Opening hours seem arbitrary. They're a small community of volunteers that keep the place afloat, so call ahead before driving." As I walked slowly away from the building, I took a last glance upstairs, hoping to see signs of life. There were none. But what I did notice was a dilapidated sign, with half the letters missing, suggesting it was the Sportsmen's Athletic Club. My mood soared. In an unlikely turn of events, I had been standing outside "Popeye" Powell's cricket club. Perhaps fate had brought me here. If I could get an interview with the great man himself, my mission would be rescued. With visions of "Popeye" and me chatting away over a cold beer, reliving his superlative innings against Bloomfield Caribbean, I eagerly knocked on the door. And waited. And waited. This time the lack of response came as less of a shock. Over the next few weeks I tried calling both Sportsmen's Athletic Club and the Cricket Hall of Fame several times a day, hoping for a different result, but it was always the same. No reply, no voicemail. In the end, I ran out of time as I was moving back to the UK. Despite an overwhelming feeling of failure, I felt that this episode perfectly summed up cricket in the US. Everyone I had spoken to, from Joe the librarian to Mo the publisher/management executive/travel arranger, and even those I hadn't managed to speak to, like the organisers of the Philadelphia Cricket Festival and "Popeye" Powell, gave their time freely, purely because of their passion for the game. It came as a pleasant surprise to learn that there were Americans who loved cricket so much, they gave up their spare time for it. It was just a shame I never got the chance to meet any of them.